Today I’m thrilled to have my buddy Viet Do on the show. Viet runs DealZon.com which is a daily deals and coupon site that caters to the gaming industry. Running a coupon site is a business model that we haven’t yet covered on the podcast so I’m very anxious to learn how the business model works and how Viet makes his money. Enjoy the show! How Viet gets traffic to his website. Steve: You are listening to the Mywifequiteherjob podcast, where I bring in successful bootstrapped business owners to teach us what strategies are working and what strategies are not. Now, this isn’t one of those podcasts where I bring on famous Entrepreneurs simply to celebrate their success, instead I have them take us back to the beginning, and dwell deeply into the exact strategies they used earlier on to gain traction for their businesses. Now before we begin, I just wanted to share a quote from Ken Schneider who was the winner of a free E-commerce consult. Here’s what Ken had to say: It is very apparent to me, that Steve has built a wealth of the E-commerce information in a way of offering ideas and needed insight that are very encouraging. After discussing an array of different ideas and possible options, he was able to provide me with the tools and information that would help me find my own niche online and for Steve’s help and information, I am most grateful. Now, if you would like a free E-commerce consult from myself, enter my free podcast contest, where I’m giving away free one on one business consultations every single month. For more information about this consult go to www.mywifequiteherjob.com/contest. And if you are interested in starting your own online business, be sure to sign up for my free six-day mini-course where I show you how my wife and I manage to make over 100K in profit in our first year of business; go to www.mywifequiteherjob.com for more information, now onto the show. Welcome to the, mywifequiteherjob podcast. We will teach you how to create a business that suites your lifestyle, so you can spend more time with your family and focus on doing the things that you love. Here’s your host, Steve Chou! Steve: Welcome to the mywifequiteherjob podcast. Today, I’m thrilled to have a friend of mine on the show, Viet Do. Now, I met Viet at Fincon and I know, I know I meet a lot of people at Fincon, which is why you should go. Anyways, you know Viet runs Dealzon.com which is a coupon sight for electronics and gadgets. Now, have you ever wondered how sites like TechBargains, FatWallet and other coupon based sites stay in business? Well, Viet does very well with Dealzon and hopefully today we’ll learn exactly how Dealzon works and how it makes its money. So, just a quick note about Viet; he’s probably one of the nicest guys you’ll ever meet and his deal sight is a business model that we actually haven’t covered yet in this podcast. So, welcome to the show Viet, really glad to have you. Viet: Hey Steve, yeah, thanks a lot for having me on the programme. I hope I can shed some light on – for those people that might be interested to the field or the kind of like how coupon sites work and maybe give them some insights on how the industry works. Steve: Yes, so, give us a brief description of your specific coupon site and exactly which products you focus on, and how you make money online. Viet: They rate our stuff. So, if they are a gamer, they want to buy games and maybe like a computer hardware that relates to the game right, to learn the game faster. So, how DealZon works is pretty simple as any other of those deal sites that you mentioned actually. Steve: Just pretend that none of the listeners know anything about how anything works. Viet: Okay, that might be a good way to go with them. So, I mean, if you come to DealZon, you’ll see a list of the best deals of the day right, and if you’re a gamer, you can see right around on the first page – oh, okay, well, this game is on sale today. So, the front page will basically show you what’s hot for the day. Now, if you want to drill it down a little more, there’ll be different categories and you can go to different categories with the type of products that you’re interested in. So, as mentioned, we’re mostly focused on gaming and technology so gaming and laptops is kind of what we focus on lately. Steve: Okay and bottom line I when someone clicks on your link and makes a purchase, you get a cut of that transaction. Viet: So this a commission based model, it’s basically lichen – an affiliate lichen, so you know, we use very typical networks such as commission junction, link share and various other networks. Steve: So, but is that for physical products primarily then? Viet: It’s actually a pretty good way to go to– about getting a game these days, and it’s expanding lately, yeah. Viet: Yeah, I don’t think so, it’s typically higher. It’s not necessary like 2X or whatever, or like 3X or whatever, just, but by virtue of the merchant not having to store anything beyond like a digital code right, that they can e-mail out right away through the system. They’re just more willing to- there’s just more margin and leeways there, in terms of a commission split. Steve: So, can you give us an idea of what some of the commissions look like on a physical product verses you know, a code for example? Steve: That is really low! Steve: Yeah, that’s like nothing. Viet: Maybe, for some very lucrative, high margin stuff, let’s say there’s something like, like a 100$ special, super limited edition game you know, so the margins might be a little bit higher where they’ll give you some as high as 8%. Steve: Okay, so the margins aren’t still as high as for something I might push on my say like web services where the pay-out is much higher. Viet: Right. It very much is a volume game for deals and coupon site, where each have to make it up in terms of volume – you have to make your site, your usability, the information you present as easy as possible to convert these sales you get these commissions. Steve: So when someone buys something through you, you don’t have to provide any sort of support or anything like that? Steve: So, there’s a lot of these tech deal sites out there, how the heck do you differentiate yourself and compete with the rest of them? Viet: Yeah, I mean that’s a good question, I mean, that’s something we constantly think about on a daily basis too actually [chuckles]. So, I hope to see like some comments where you guys can give us tips to – I’ll be honest – that’s pretty funny that I’m asking that, but [chuckles]. But, how we kind of differentiate ourselves is, what I imagine is, straight from the start, we focus on what we do good at – what we do well at, actually, which is gamers, right—we focus on it, we have a cool audience of gamers, we kind of know what they like, we get a pretty good feel of what they like in terms of products, so we serve that particular niche. So, instead of doing like all these different types of coupons for everything under the sun, we focus on what we do well at, and we try to provide a better service in that sense of better updated deals, more timely updates, stuff that you might actually, not so– I’m pretty confident that some of the games that we list, maybe it’s only going to give us like 10 sales, and these are pennies on our dollars, but these aren’t stuff that other sites will focus on whatsoever like, you won’t find it there on these other deal sites. So, the comprehensiveness for a gamer, in the sense that, if I’m a gamer and I want to make sure I don’t miss the hot deals, then I can go to Dealzon and I can pretty be– rest assured that maybe I’ll catch like 90% of the deals. Steve: I see so by focusing on something you actually will probably get the deals listed first because the other sites don’t care as much and then as a result gamers will learn this overtime and then come to you first. Viet: Right, exactly, I mean that’s basically our hope and I think it’s been doing pretty well actually. Steve: So okay yeah. So there’s a couple of questions I have now. So one; how do you actually get the deals on your site? Viet: Yeah, so it’s actually very similar format all across the board. It’s a very chaotic thing in terms of the coupon space in the sense that you know there’s 1000s of merchants and there’s 1000s of deals right hunches of 1000s of deals even. Most of the merchants actually– you will be surprised a lot of that stuff deals is in virtual edition now, they plaster our email and no kidding. An email with the list of the top deals for up to the week. So it’s like a feed of emails– you open your inbox it’s like a hunches of emails coming in. Now obviously a lot of the better networks still have a API where they a certain theme where they’ll send out like you know the data, but a lot of them is unnecessary human because some– You can already exactly see the data and then copy and paste to your site basically. You need to able to manipulate this second data essentially. Viet: So there’s actually a lot of work involved in that, and I think there’s actually a few services that– so because the work looked so much because actually a few services that we don’t actually this but they make the transition easier. So they grab all the fin and all the different coupons for you and then they break it down in like a CSV file for you or what not, based on how you want to export and I think what’s this service called. Let me think, it’s not [Inaudible] [00:12:12]– I think coupon to me, so. Viet: So that’s one of the services, you know. Viet: Yeah so, the merchants would– most merchants, the large merchants don’t have like an account manager of some sort, right and they’ll have like weekly deals right. So they’ll be like hey this is what we are trying to promote on our store– on our online stores this week. Take a look at the list of our deals. And it could be any kind of format it could be just plain text email format, it could be attach excel file, you know could be just a bunch of bullet points, could be a strayed out HTML files encoding of the deal in question right. Steve: Okay and how do you get that on to your site is that then manual then? Viet: Yeah, so there is quite a bit of manual work involved but we build our own tool. There’s actually– so I’m not in the coupon safe spacing internet buying. I’m pretty sure there are word press plug-ins that make your life a lot easier to get e-step in but at some point you’ll still need a manual, human editor involved to like either copy and paste or make sense of these data you know like here’s some because some bit of words that come in might not– might truncate a little bit, might not that you know just spread properly. So we build our own tool we have our own platform that grabs all these feeds, whether it’s email or data you know straight from the API or our feed or X amount feed from the merchant and it’s mostly XML feed actually. Viet: Yeah and you know we make sense of this data on our back editor, human editor kind of adviser and properly in all that great stuff. Steve: So what you are saying you’ll receive list of these deals in all sorts of different formats depending on the person – depending on the business and then you have tools in the backend that kind of code in all these information? Viet: Yup, exactly so in that sense yeah there’s definitely a lot of work and then that’s kind of why we focus on what we do while we’re out too because if you expand too much more retailers it just really becomes like a major headache right? Steve: Yeah, by the way. Steve: Yeah, that’s crazy and that can be fun and it’s kind of manual, right? Viet: Right, right yeah. I won’t necessarily call it fun, but you know it really depends on how you take a look at it you know our editors and myself included, we try to– maybe that’s so much these days but we try to be able make it a game out of there like say, who can post you know the best deal the fastest in that sense right. Viet: On our day Face book feed or you know our Tweeter feed or what not, right. Steve: So on the flip side also there’s a bunch of deals that expire everyday too. So how do the heck do you know when to take these things off and that stuff? Viet: We just simply send them on our backend and it’ll automatically expire mostly, and if we don’t capture you know usually a user we’ll comment and let us know that hey this deal is expired, then we know we just go out– head out there and expire that deal. Steve: And they actually have an API where you can just grab everything kind of automatically into your platform with a little bit of programming. Steve: Do you guys have a preference or do you just kind of go with where the deals are at? Viet: We kind of go with where the deals are at actually, but we definitely do utilize that you know obviously you want to make the manual work load as low as possible. So if you have the resources you get a developer to you know work out your own– what does your own platform of grabbing these things in properly to fit your– to fulfill your needs, that’s way better right than doing it manual, but on other times the ones that already make money is actually stuff that’s happening in right traditionally in email actually you know where a manager– a store manager might have– and a fully account manager actually let me correct myself– will be very in tune with what we need or what those were with our audience and they gave us a head start hey this deal is happening next week if you have some details in the email right. Viet: We just watch out for that deal you know and yeah we can of course we can always grab it automatically whenever you know from the API or from XML deal but that’s always depending on like you know whenever we set these automatic data grab to happen right, so we very well might miss that X– the actual hour where the deal goes live right. Viet: So a lot of the more exclusives or the deal that people actually deal one actually happens lot in email so. Steve: Interesting email, wow that’s horrible. Viet: Yeah that’s horrible actually. When you even think about it and you know there’s pros and cons in there you have the good communication channel with – and you work with these people and you do good large volume with them. So there is a need for the– an open communication channel but there’s– I won’t be surprised you know if there is a better service in the next few you know whenever actually to make the job easier and you know the space is right for some sort of disruption that’s for sure. Steve: Okay, so what you – what I’m trying to gleam off you know is, you know essentially all the sites have access to the same coupons essentially right? Viet: Yeah, I mean you’re not going to really get like all these unique stuff I’ll be honest. If you find like a deal site you like and you use allegory you know, hey more power to you keep using, you don’t really need to come to DealZon and that sounds so bad actually. Viet: But I feel like you know a lot of times unless, unless all you care about is gaming. So yeah you should actually come to us. Steve: So I mean so each, each text like kind of has its own focus right because you said it’s kind of manual. You kind of have to pick and choose what you want to focus on right? Viet: Sure, sure that’s for me. So but you definitely want see some of those the same stuff on most sites but the difference is may be what they highlight isn’t what’s the hottest latest right now. A lot of these stuff especially front page is very much click carried and right by the editors, right. Viet: So and you know so you needed to juggle between like hey is this guy really –is this really a good deal or is it just something that’s pushing you to sell because it gets in the most commission right? Viet: So, and so it’s mostly that I think and I think because of human automatic coration [phonetic], if you start you know agreeing with what the editor puts on and chances are that’s a great deal then yes you should be comfortable with that site in the sense that they are pushing stuff that they know people like and want and not just because what’s you know shows the bottom line or converts better or what not right. Steve: Okay, okay so that kind of actually leads to my next my question is, which is you know how do you actually get people to come to your coupon site in the first place right? Viet: Yeah exactly, you know like hey you know may be the latest Mark book Pro just slashed the price by 100 bucks and that’s actually very rare for Apple products, right? Viet: And you know stuff like that basically and then you slowly and surely you build some links you know you send some else – some good new steps and you build an audience that way. And another method that we kind of use is we partner with a few different sites and if they have the right community and then if the fit is good, we post regular deals on their site and if in terms of – in the format of a blog post or a news stead or and stuff like that and that’s how we kind of like funnel trafficking sometimes. Steve: What do they get in return for the blog? Viet: You know the page views you know they – sometimes we have very rarely do we have like revenue share agreements you know and then when we have that obviously we have to disclose it carefully. So that works out when it fits with in terms of the community and audience right. We do this with may be like with individual sites, where, maybe some guy runs a gaming blog, right, and he knows that people like these kind of deal posts, and it helps support the website, helps support the community, you know, so it’s a win-win for everyone involved. Steve: I see. But let’s say, I run a really popular gaming site; why wouldn’t I just put my own coupon codes on there? Viet: Yeah, I think you should, actually, but we go back to all those hassle, all those manual stuff you know, you really have to be on the know, in terms of like what’s going on this week and what’s going on next week, to properly do something like this, I feel. So, I think, if you run a gaming blog, you should definitely do this, or use DealZon, basically, and we will be happy to help you out, and work out an arrangement that makes sense. But yes, I think, if you run a gaming blog, and your only revenue source is like the very typical display ads and stuff like that, you should start considering an affiliated model; there’s certain ways you can do this balance without coming across as if trying to sell all these games to visitors, right? Viet: Because this really is a value in the sense that, hey you know, ‘buy this game because it’s cheap– I mean, we’re not telling you to buy it, but we’re telling you what is cheap right now, whether you buy or not it’s up to you, right? Viet: So there’s some actually a value in terms of that service. Steve: Okay. The other thing I did notice, when I went to your site, was you actually do advertizing also. And when I saw that, I was somewhat conflicted because, shouldn’t the goal be to have someone click on your affiliate link and buy something? Viet: Yeah, actually, you are correct about that; for a very long time, DealZon had zero display ads. You can make the argument that the entire site’s being advertised now, because every click will generate a commission sale for us, right? Steve: I see. So you just add them on, just to see if it’s going to affect your affiliate revenue; it didn’t affect it, brought in more money, so you decided to keep it on. Steve: Yeah so, sell it privately to an advertiser. Steve: Okay, so in terms of getting traffic, you mentioned working with other bloggers; are there any other traffic sources that you use? Viet: Yeah. So, eventually, you know, we still get plenty of Google traffic – we try to rely less on Google these days, in the sense that we don’t really bother with optimizing that much anymore, in terms of SEO. If we have Google traffic, great, it’s because we have the right information and the right value, if not, whatever, right? Steve: So, by information sorry– is this your blog post, or are these the deal pages themselves? Viet: Both, actually, but mostly the deal pages themselves. We try to provide as much information as we can on a deal post, especially on the hot stuff — on the stuff that’s trending. So if there’s like a super old laptop, you know, two years old, obviously you’re not going to find the latest information there, right, because at this point, no one is going to buy that kind of particular laptop anymore. But for the latest stuff, yeah, I think so, we might have like hey more information on a particular computer model, hey maybe you should buy X over this because of these features, so stuff like that, basically. Viet: It’s mostly in the edited notes; we have a lot of it back in the days, but, like I said, we try to rely less on Google in a sense, so we only provide those information that is useful to our users. I suppose you can make the argument that what’s good for the users is good for Google too, but that’s always a bonus in the sense that I mean, there’s a lot of sites that bounce just a lot of key words in content, and by the virtue of their domain authority, they will rank for it, right? Viet: The coupon space is kind of iffy that way in the sense that sometimes and I’m sure a lot of users will know this– they search for a particular coupon in the other site, and there’s really no coupon! Steve: It happens to me all the time, it’s very annoying. Viet: It’s very annoying! We try to stray away from that as much as possible. Yeah, it makes us a little bit less money, but I’m a little bit more happy about it – I sleep a little bit better at night, you know. Yeah some people can say that you’re throwing away money, but if the coupon doesn’t exist, we say so; it’s expired. You can still click through it if you want to, you know, if you want to check if there’s something new, but there’s no coupon, so that’s that. Steve: Okay. And I would imagine you don’t do any paid advertising, because the price just doesn’t work out economically, right? Viet: I think it does, actually, but we don’t do that. I’m not sure if I’m giving too much information in that sense, but [Inaudible] [00:27:03] pretty much all of our revenue in a sense, is very much organic, it’s very much the users on DealZon, and some portion of it for our partner blogs. Steve: How would pay traffic work? I mean, you’re paying an amount that seems like it’s a lot higher than your affiliate products. Viet: It’s tough, right? I mean we’ve dabbled in it, and I can see it can work, but I’m not a PPC expert in the sense that, I can’t juggle that on a daily basis, and it’s very much average where you have to make sure whatever you bid is obviously a lot less than the commission you get. And it actually does still work well; you’d be surprised like how some of these large retailers just don’t do a good job advertising their own products or their own stores. So, there’s still a lot of space for the middle man, in a sense, the whole system still works. Instead of having their own internal team, they just pay it out by the affiliate model that way. So it’s kind of funny, I think going to change in the future, especially– if I run any one of these– If I’m like the business guy, or the revenue guy at one of these larger companies, I will think strongly about having my own PPC team to do the– and they do have them, don’t get me wrong, but between them and the affiliates, it’s an interesting space where you’re just throwing a lot of money, to try to break even, or to try to make like, the actual dollar out of your 50 cents spent– ask them. Steve: Sure, sure. Do you guys do a lot of email marketing? Viet: Lightly. We have our email list that’s fairly large, in a sense that I’m planning to trim it down to the guys that don’t really open our emails anymore, to save our costs. We do email marketing, we send out daily emails, and we’re starting to do a better job segmenting these. Some people actually only want to see video game deals, some people only want to see computer deals, some people only want to see HD TV deals. We find that that helps conversion a little bit more. So if you can segment it and if you have the volume that justifies it, you should definitely do it. And, hopefully the whatever email service provider that you sign up for has the segment ability. Steve: How do you get people to sign up for your email list? Viet: I think it’s very similar to what a lot of sites employ, so you know, there will be a pop up overlay, telling you to sign up. We try to be less– we try to balance between being annoying about sign-up and trying to make sure we convert these sign-ups, because if you’re just having a side-bar box, I’ll be honest, a lot of people aren’t going to see this thing, right? Viet: The conversion difference there is like astronomic– could be something like 0.1% versus 3%, so that’s a big difference. Steve: So I see. I would imagine that your sign-up rate would be kind of high– everyone wants to get good deals on stuff, right? I would imagine it’s pretty attractive. Steve: Yeah, I know from my site I mean the pop-up is what actually converts the best. Steve: Okay so, towards the beginning of the interview, you mentioned that sometimes you can get exclusive deals from affiliates, and it’s all about negotiation. So how does all that work, exactly? Viet: Yeah, so I mean this is very much about chicken and [indiscernible][00:30:59] right, in the sense that, an exclusive is great – you get like an exclusive that people can only come to your site to get it, right or it might leak out get it elsewhere, but mostly people will come to your site to get this exclusive deal. But if you don’t– in order to get the exclusive, you need to have the right volume, to start negotiating with these partners, right and to introduce these merchants. You can see the dilemma here, in the sense that if you don’t get the exclusives, you won’t have the volume, and if you don’t have the volume, you won’t get the exclusives. Viet: So I would definitely start– for anyone that’s inc. like a region space– my recommendation is basically just ask outright. Ask them hey what kind of volume we need to get to get some kind of exclusive deal or something that might be– and to be fair some of these exclusives are not exclusive in a sense that they will not happen again but it will be fogging you for that time period basically. Does that kind of make sense? Steve: Okay, yeah. So how does an exclusive deal work exactly? Is it the pair on hire or is it just by virtue of you being exclusive that’s good enough? Viet: Oh no I think it depends on how what the — it’s very much merchant dependent so sometimes he has to pay as you higher sometimes they give you a better deal like a better percentage coupon, right. Viet: So you know it converts even better because why use this other coupon this other site if this coupon gives you 25% versus 25% this other side right? Viet: So there is a lot of that– and sometimes it makes them both, sometimes it’s just simply this deal is only offered through this site at during this time frame through this link. Steve: So walk me through this; let’s say you gain an exclusive, what’s your first course of action. So you email your list, do you also still reach out to bloggers about your deals? Viet: Yeah definitely. If we manage to snuck an exclusive we want to promote as much as possible simply because we are hoping that’s the best deal right? Viet: So yeah the first course of action is actually you should get your own site, you blast out to the people that convert the best which is usually your email people and sometimes your social people. You know maybe for some people the measures are– it is that’s where your audience lives. And you actually basically mention the full cause of the action and then we blast it out to your partners and then finally you want to blast out to the rest of them. So I think anyone in any kind of space should always have an excel sheet or whatever of regular people to email blast things to and on top of like the new tips sites you know TipsAtWhatever.com right, in whatever industry and category you are in. So that whenever you have something interesting and note worthy you can always rely on the list to get at least a few mentions of whatever you know exclusives or promotions that you have at the time right. Steve: So what are your top traffic sites right now?– sources of traffic. Steve: Okay no that’s fine. Viet: Okay yeah, but to be honest most of our traffic is still coming from DealZon actually. We have a very healthy amount of users on DealZon and in terms of revenue numbers a good chunk of it is still coming from DealZon too. So like I said we are doing a very decent job theses days of diversifying our traffic source and income source. Three years ago, I want to say, Google would bring about like 50% of our traffic right, and 70% of our revenue. That’s actually quite a big chunk right. Viet: Just because it converts better. These days we make way more than we did before and Google is like what, 20% of our traffic visit and, maybe exactly the same amount, 20% of our revenue too. So at some point you already want to move away from a Google mentality and I think you definitely mention this a lot of times you know whether in your podcast or in blog post right. Viet: Two thirds and you know and email list is one such great revenue source right. These are people that opt in the people that already want the information right. So if you can build a channel like where no one else can mess with, I want to say that’s a good comfortable spot to be at. Steve: Okay, so if there is someone out there who wanted to start their own coupon site how would you suggest they start. So one thing I forgot to ask you about is that actually what platform you run your site on? Viet: So we actually– we built our own site. It’s on rails, we’ve been on rails. We built our own platform essentially. We have our own backend and our own frontend. This is actually more household than it’s worth–. Well, okay I think it’s working for us for our own usage but this goes to your question if you are starting a coupon site today, you know to make your life easier you should really just get a word press blog and there are various amounts of coupon plug-ins. I haven’t been keeping up to date on them but I know there’s obviously two, three pretty decent coupon plug-ins and coupon site templates that you can use right. And then really you should just find a specific niche that you do very well at right, and that you are very familiar with, that you are an expert at instead of trying to cover everything under the sun, you know try to cover that one thing that you can do a good job at providing information at. So that’s kind of where I’ll start. Steve: Okay and then in terms of — you guys have a blog too right. So what use has the blog been in terms of…? 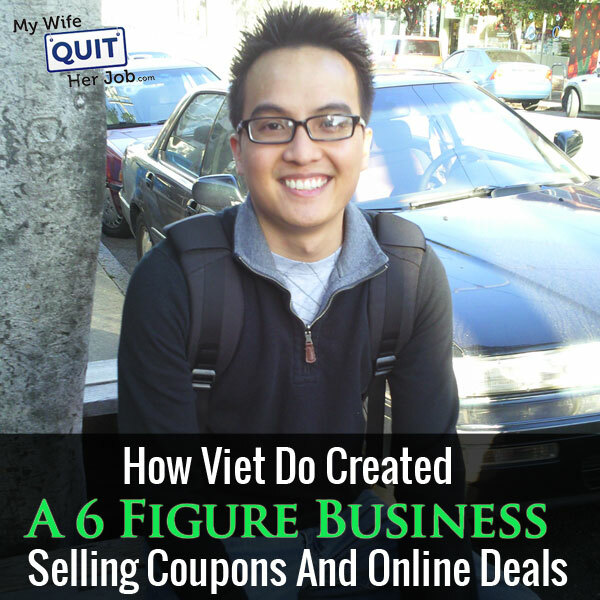 Viet: And for a blog you already want to do it so you supplement information in terms of deals that you’re– So for the coupons site I feel like the best way to do that is that you do price comparison or price prediction stuff like that basically. Steve: Okay and one thing I also forgot to ask you is what was the source of your inspiration for even deciding to do a coupon site as opposed to some of the other business models out there? Viet: So I think there is a lot of different things but I don’t think was ever marrying into the idea of like starting a coupon site and actually I did not start this. There is a different partner that left since then actually but I decided to join DealZon because I thought it’s interesting and there’s all things I can bring to the table in terms of the categories that we are focused on at the time and that was my expertise and this goes back to what I mentioned about how if you have expertise in terms of a particular category you know, I’m a gamer I’m a computer user, I know my computers very well maybe I know less these days than before because I don’t have time to read about this stuff anymore but if you are more comfortable to talk about a particular product and you enjoy talking about that particular product, it’s just a lot easier to try and sell those products too right. Viet: So it’s mostly that I think and you know I think at a time, you know, it’s kind of like- this goes to what we had mentioned earlier- if you search for coupon you run to your site and it’s just bunch of links but there is no coupon to be found, that’s annoying right. We wanted to try a little bit better than that basically. Steve: Okay and so you do this full time? Viet: Yeah I do this full time. Steve: So were there– what was your source of your inspiration? Was there any books that kind of gave you the inspiration to say,” Look I want to start my own site and run my own business”? Viet: I will be frank, not really. I think I am one of those few that started their own site back in the 90s right, and they would just miss the bow in terms of like becoming like one of those dotcom millionaires so I– but then we learn a lot in the process and we enjoy working online building websites, interacting with users and readers. So I think it‘s essentially that really verses like any one book or any one particular thing. Steve: And are there any resources or services out there that you can’t live without with your site? Steve: Okay, cool so Viet we’ve already been talking for quite awhile, where can people find you online if they have questions? Viet: So if you head to dealzon.com there is contact form there but just email me at viet@dealzone.com and I’ll be honest, I mean I don’t mind giving up that, I think it’s a public email actually so yeah viet@dealzon.com and if you have random questions like this I will try to take some time out to try and answer them as best as I can. Steve: Awesome well thanks a lot for coming on the show Viet. Viet: Yeah, no problem I will talk to you later Steve. Steve: All right talk to you later, have a good day. Hope you found that podcast episode interesting. Now I for one have always wondered what it was like to run a coupon business online and at least at the back of my mind I always pictured a very hands off site that made money on auto pilot by automatically grabbing deals from a feed and displaying them online and as it turns out it’s not that simple and I probably should have known better. Now Viet shared some very useful tips on how to get traffic to a coupon website and I’m very thankful for his candor and revealing how his business works. For more information about this episode go to MyWifeQuitHerJob.com/episode 28 and if you enjoyed listening to this podcast please got to iTunes and leave me a review. When you write me a review it not only makes me feel proud but also helps keeps this podcast up in the ranks so other people can use this information, find the show more easily and get awesome business advice from my guests. It’s also the best way to support the show and please tell your friends because the greatest compliment you can give me is to provide a referral to someone else either in person or to share it on the web. Now as an added incentive, I’m also giving away free business consultations to one lucky winner every single month. For more information about this please go to mywifequitherjob.com/contest and if you are interested in starting your own online business be sure to sign up for my free six day mini course where I show you how my wife and I managed to make over 100k in profit in our first year of business. Go to www.mywife quitherjob.com for more information and thanks for listening. Thanks for listening to the Wife Quit Her Job podcast, where we are giving the courage people need to start their own online business. For more information visit Steve’s blog at www.mywifequitherjob.com. Great interview and guest. Learned a lot and Viet seems like a nice guy. I have visited coupon sites in the past trying to get deals and have found the majority of them are a waste of time. They either don’t have the deal in the first place, or the coupon is expired. Meanwhile you have given them your email address. So now I don’t bother going to them. I don’t do gaming but Viet’s site seems like it is working well because it is focused plus provides actual value to the niche. Congratulations.